Nahizaa’í shí nahi’át’e’í bił béyaa’iłt’á. Nahizaa’í shí nahi’át’e’í bił behndénńdlį́. Nahizaa’í shí nahi’át’e’í bił be’indá shí bendéda’iłchįį-gu nłdził-gu ndásá bee huuka nahi’ełchíńdé báháádaat’į́. 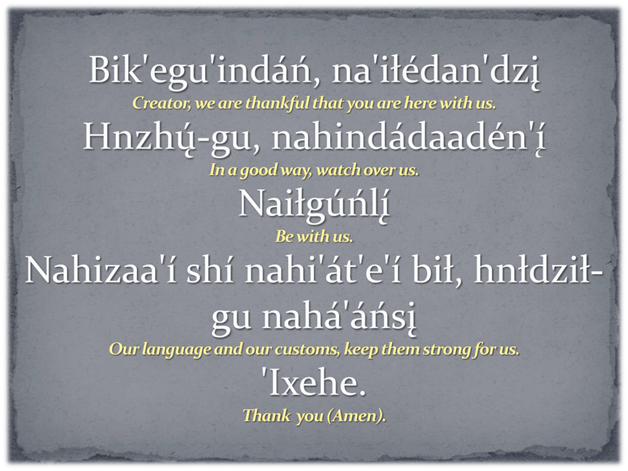 Our mission is to defend and support our Apache language and culture. Apache language and culture are critical to Apache identity. Apache language, culture, and identity are critical to survival, respect, pride, health, and welfare of all members of the Mescalero Apache Tribe, especially children. What are our specific goals, given the mission? › Increase use of Apache among all age groups. › Increase use of Apache in all situations, including home, school, work, ceremonies, and other social situations. › Increase the number of tribal members who read and write Apache. › Increase the number of tribal members who know Apache history and culture. › Increase the number of tribal members who participate in traditional cultural activities. What is our current strategy to meet these goals? › Recording and documenting the Apache languages. › Recording and documenting Apache culture and history. › Revising and updating Apache language and culture curricula at the Language Program, the Immersion School, and the Mescalero Apache Schools. › Developing and producing Apache language materials. › Developing a plan for creating the next generation of Apache language teachers. › Continue our current efforts while incorporating new ideas and approaches. › Establish a strong network of community groups to promote preservation efforts. › Focus on positive efforts and outcomes. » Requiring tribal employees and administration to be fluent or take classes in Apache. » Allowing tribal employees and administrators to attend Apache language classes during the day. » Requiring the schools to graduate students who are fluent in Apache. » Creating a scholarship fund for tribal members to become Apache language, culture, and history teachers. » Creating incentives for using Apache in the home and other places, for elders to use Apache with fluent and non-fluent tribal members, and for other people to learn and use Apache. What can we do beyond the reservation to support our efforts? › Work with the Tribes and Pueblos of New Mexico to increase support from the state for Native American language and culture preservation. › Work with all tribes to increase federal support for Native American language and culture preservation. › Work with Ruidoso and Tularosa school districts to make sure that our children who attend school in those districts can study Apache language and culture.